HS TRACK on Tuesday, April 2 @ Osage City is now CANCELLED for OHS athletes! CANCELLED: Little Eagle Basketball Clinic scheduled for Monday, February 11 is cancelled. It will NOT be rescheduled. Sorry for the inconvenience! RESCHEDULED: HSBB (H) vs. St. Paul on Saturday, February 9 Starts at 4:30 PM in the big gym NO JV games! NO Pep Band! Spread the word. CORRECTION: Junior High Quiz Bowl for today has been postponed. We do not have a new date yet, but we will let you know as soon we do! Sorry for this miscommunication, Mother Nature is really making it difficult to stay on top of all these changes! IMPORTANT: Tonight's varsity basketball games against Crest have been postponed to Monday, February 11. They will begin at 5:00 PM. Varsity Girls followed by Varsity Boys Only! 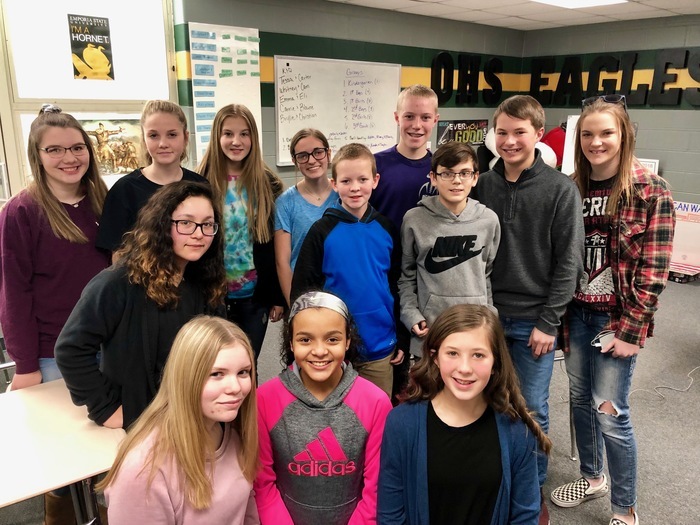 CONGRATULATIONS to the Olpe Junior High Quiz Bowl teams at their first meet of the year on Wednesday! The Varsity team PLACED 1ST and the JV team PLACED 3RD! WAY TO GO EAGLES, WE ARE PROUD OF YOU!!! Olpe FBLA attended the District 7 Conference at ESU on Wednesday. 32 of the students scored in the top 10 in their event, see their individual results in the pictures! This meets our districts qualifications to attend the state conference in April. GREAT JOB EAGLES!!! Don't forget the After Prom Pulled Pork dinner tomorrow, Friday, February 1 during the OHS basketball games vs. Lyndon! Serving will begin at 4:30 and a free will donation of $6 is suggested. Upcoming High School Basketball Schedules! Take a look, as some games could start early! The Class of 2020 After Prom is having a Pulled Pork dinner on Friday, February 1 during the OHS basketball games vs. Lyndon. King & Queen of Courts is also this night. Serving will begin at 4:30 and a free will donation of $6 is suggested. Hope you can make it! The OHS Psychology class traveled to the Topeka Correctional Facility on Friday. They toured the facility and interviewed inmates. It was an incredible learning experience. No cameras were allowed at the facility so here they are eating afterwards!! Congratulations to the following Olpe Junior High Spelling Bee Finalists today! Truman B. - 1st, Sylvia S. - 2nd, Mia K. - 3rd, Achilles G. - (Alternate) They will compete in the Lyon County Spelling Bee at 9:45 on February 5th at the auditorium of the Emporia Humanitarian Center (Old Lowther South), located at 215 W. 6th. Daycare enjoys paint & ice! Don't forget tonight's OES PTO meeting tonight at 7:00 PM in the Olpe Cafeteria! Eagles lead Jackson Heights 7-6 at the end of the first quarter. Eagle defeat Christ Prep 13-8. Lady Eagles win in 2 vs. Madison. Official ground breaking set for Thursday, Aug. 30 at 9:30am.